No more fear for your security as you travel the thick and vast Nyungwe National Park in the South Western Rwanda; you will rather enjoy wildlife 24/7. Rwanda Energy Group (REG) is working on a project to install streetlights to a total 97-kilometer road network of Nyamagabe – Nyamasheke and Pindura- Bweyeye, which meanders through the park. “Within two months, we shall have connected that road to the national grid. The intention is to assure security, promote business and tourism in Nyungwe and its vicinity,” said Joseph Ntwari , the REG regional director in Rusizi district. Pindura – Bweyeye is the nearest road that allows the Bweyeye citizen to communicate with the rest of the country. It takes them 2.5 hours to cross through the forest. Remotest neighbourhood of Rwanda, Bweyeye trading centre is located on the border between Rwanda and Burundi. It was also connected back in 2019, a move that was welcomed by the citizen. 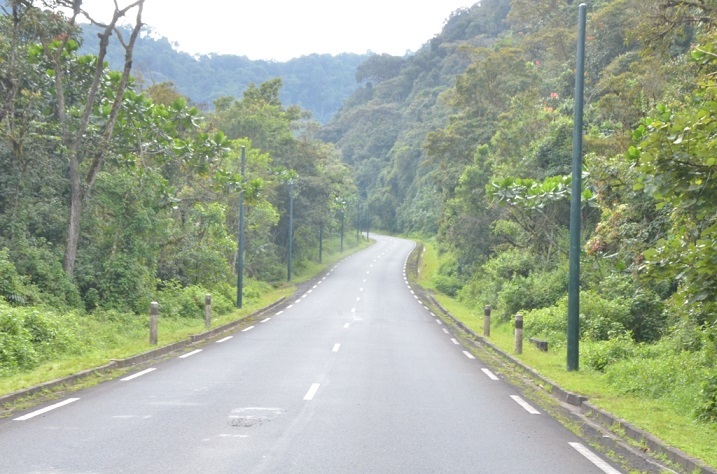 Nyungwe road is also used by tourists who visit the only canopy walkway in East Africa and the rich biodiversity of the Nyungwe natural forest. “No more fear for our security. The street lights will also facilitate our trade with the rest of the country,” said Fidele Ndayizeye, a resident of Bweyeye adding that they feared crossing at night. For example, he said, some types of lights attract insects that can be food for the animals adjacent to the road. It is important to examine whether those insects would not endanger the life of such animals. “In other cases, some animals may naturally enjoy the day and sleep at night. If they are adjacent to the road and find light 24/7, this may cause stress. That’s how the environmental impact assessment comes in to answer such concerns,” said Ntihemuka. Nyungwe National Park receives an average of 40 visitors every day, according to Ntihemuka. On top of its rich biodiversity, the Nyungwe National Park attracts visitors for its Canopy walkway. After the visit, they can spend the night at One and Only Nyungwe House, a five-star Hotel in the forest.